Alexander Jerome Gould (born May 4, 1994) is an American actor and voice actor. He is best known for voicing Nemo in Finding Nemo, Twitch in How to Eat Fried Worms and Shane Botwin in Weeds. He was born in Los Angeles, California on May 4, 1994. His parents are Tom Gould and Valerie Gould. He has two sisters, Emma Gould, and Kelly Gould. Both are also actors. Gould has been an actor since the age of two. He had roles in the Television Series' Malcolm in the Middle and Ally McBeal. He voiced the title character, Nemo, in the animated movie Finding Nemo. He also starred in How to Eat Fried Worms. He received a Young Artist Award for each. He won his third Young Artist Award in the Showtime series Weeds. ↑ 1.0 1.1 "Alexander Gould CELEBRITY". TV Guide/CBS Interactive Inc. Retrieved 18 July 2015. ↑ 2.0 2.1 2.2 2.3 Jason Buchanan. 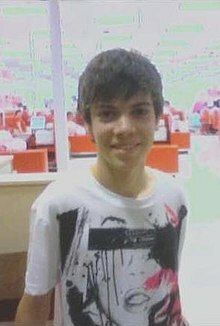 "Alexander Gould Biography". AllMovie/All Media Network, LLC. Retrieved 18 July 2015. This page was last changed on 26 February 2017, at 08:12.